This swing thought has you concentrating on moving the left knee straight forward during the backswing. This is in contrast to seeing the knee cap move sideways and down towards the ball or towards your right foot, or in other cases towards the right knee. Moving the left knee brings along with it the rotation of the upper body. Indeed, as you move your left knee cap – without changing the flex in that knee – your hips have no other choice than to react. 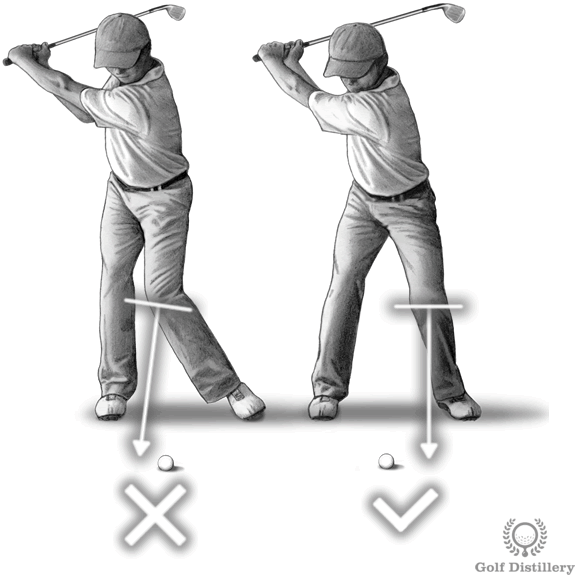 By moving it forward, the hips are naturally turned back and allow for the backswing to occur. Furthermore, by making sure the kneecap doesn’t move laterally, you are limiting the overall movement of your lower body, and in doing so promoting a more reliable and compact swing. Swaying occurs when the hips of the golfer slide laterally; back during the backswing and forward during the downswing. It can find its way into a golfer’s swing when the hips don’t actually pivot around a central point but rather give the impression they do by moving back and forth. By guiding the left knee forward and in doing so rotating the hips back you are encouraging a turn on an axis instead of a lateral slide. In addition to that, restricting your left knee cap from moving towards the right knee or towards the ground limits the amplitude of the upper body rotation, shielding you from overextension or over rotation problems. The left knee has a direct influence into what the hips are doing and how they move. By guiding the left knee on a designated path – which is easy to do – you are helping guide your hips along – which is harder to do. Many problems in golf arise from hips not performing as they should, such as swaying. Using the left knee is a great way to get your hips to perform as you want them to. Golfers using this swing thought should be careful and make sure their body weight is still shifting towards the right foot during the backswing. A pitfall to using this advice would be to see the weight stay evenly split at 50/50 across both feet during the entire swing, which will translate into reduced shot distance. Or worse they could develop a reverse pivot by shifting the weight towards the left foot instead of moving it towards the right during the backswing. This swing key can be incorporated into any swing that requires you to rotate your upper body. It is best avoided for putting, where no hip action is encouraged.